As the nineties roared on hip-hop continued to grow and expand. The east coast born genre grew up and begin to venture out of its childhood neighborhood and would eventually not only blow on the west coast but also touch all points in between. As hip-hop became more commercial, it was only a matter of time before it would become an international phenomenon. So naturally, our neighbors up north had to send representatives. Enter King Lou & Capital Q, hailing from Toronto, Ontario, know to the world as the Dream Warriors. The DW’s can be classified as an alternative rap group, considering their abstract rhyming style and jazzy instrumentals. 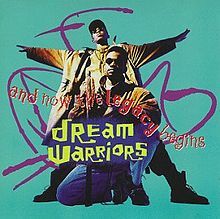 I’ve heard interviews with the duo taking credit for being the first group to incorporate jazz into hip-hop, which would be true if groups like A Tribe Called Quest and Gangstarr weren’t already 2 albums deep into to the jazz-infused hip-hop before the Dream Warriors dropped their first album. The duo would strike a deal with now defunct label 4th & B’way and release their debut album And Now the Legacy Begins . The DW’s Wikipedia page claims “ And Now the Legacy Begins is regarded as one of the finest alternative hip-hop records of the golden era”, which means either King Lou, Capital Q, or one of their momma’s edited the page because I’ve never heard the Dream Warriors name nor And Now the Legacy Begins come up in that discussion. Maybe they meant the finest alternative hip-hop record of the golden era, in Canada? My Definition of a Boombastic Jazz Style – The instrumental immediately made me think of the Austin Powers movies, as it samples Quincy Jones’ “Soul Bossa Nova” (which is also used as the them song for the Austin Powers movies). King Lou and Capital Q have a very intricate and coded rhyming style, that will either peak your interest causing you listen to each verse several times to get the message or you’ll become so bored and frustrated that you’ll give up on duo and keep it moving. Thanks to my dedication to this blog and the charitable service I provide to you the reader, I will listen to the entire album. But I’ll be damned if I rewind each verse to get all their abstract points. Follow Me Not – This one opens with an interesting question (which also doubles as the hook): “Who is more fool? The fool, or the fool who follows the fool?” One of the two (sorry, I have a hard time telling them a part at this point) spits an interesting verse which is a little less coded than the previous song, and might even answer the hooks initial question. I’d have to listen to it again to confirm, though. The jazz-tinged instrumental was kind of nice, making for an enjoyable listen. Ludi – The DW’s dedicate this one to the board game Ludi, which apparently is pretty popular in Canada. The instrumental was kind of cheesy and this one didn’t really work for me. U Never Know a Good Thing Till You Lose It – Uses the same sample used on Brand Nubian’s “Feels So Good” (a bonus joint on the cd version of One for All ). Once again, you’ll need to pull out your decoder to get the just of what the DWs are talking about, but unlike “Follow Me Not”, this one is all over the place. So much so, even listeners blessed with the attribute of long-suffering will grow weary listening to this one. The screaming on the hook doesn’t help matters, either. And Now the Legacy Begins – The Krush and Skad (yeah, I never heard of them either) produced instrumental has a west coast funk feel as it samples Tom Tom Club’s “Genius Of Love”. King Lou and Capital Q each spit a verse and sound more as ease on this one than any of the previous songs, but overall the song was just okay. Tune from the Missing Channel – The hook uses the same sample that the UMC’s would later use to perfection on their often slept on classic “Blue Cheese”. I couldn’t get into this one as the instrumental was trying to be too many different things and I still have no idea what the song title or their lyrics mean. Wash Your Face in My Sink – I’m assuming the title is a clever way for our Canadian brethren to say you can’t hold their jock straps. Regardless, the rhymes were pretty cool and I dig the horn sample brought in during the hook. Voyage Through the Multiverse – The DWs are in battle mode as both King Lou and Capital Q drops some pretty slick rhymes over a dark instrumental that reminded me of Kanye’s “Get High”(circa The College Dropout ). I can dig it. U Could Get Arrested – Special guest (or guests?) Split Personality takes on double duties (no pun intended) as he gets a production credit and spits a few verses as well. Each of Split Personality’s personas gets a verse, with the first one sounding like Bushwick Bill and the second a poor man’s Kool Keith. The song was tolerable. Face in the Basin – No, this is not a remix of “Wash Your Face in My Sink”, but what’s up with their obsession for getting people’s faces wet? Oh yeah, the song. It sucked. Do Not Feed the Alligators – What starts off as a clever warning to all competitors, quickly turns into an exercise in repetition at its most annoying level, as King Lou and Capital Q spit the same verse 3 times, and I lost count of how many times they repeat portions of their verses after that. I mean, the verses were cool, but they weren’t all that. Overkill much. Twelve Sided Dice – The DWs use the same sample used on EPMD’s “Please Listen To My Demo”, mixing it with a few other elements that give it a darker feel than their fisherman hat brethren’s interpretation. Not sure what the title of the song is a metaphor for, though. Maximum 60 Lost in a Dream – I’m assuming this was part of an inside joke? Answer for the Owl – King Lou and Capital Q get loose over a decent instrumental to bring And Now the Legacy Begins to a decent end. After listening to And Now the Legacy Begins in its entirety for the first time, there is enough to tickle my interest. Some of the Dream Warriors production is interesting, and there are a few songs that I wasn’t crazy about after the first listen, but have potential to grow on me over time. Lou and Q are competent emcees whose lyrical abilities are often overshadowed by mediocre deliveries and heavily coded verses, so if they don’t appeal to you I completely understand. Overall, not a bad freshmen project. I’d check out their latter work if it pops up in the used cd bin for a few dollars.